Andy H: This week I'm probably most excited to read X-Men Gold Annual #1. There's not a lot of information out there but as it's an Excalibur story, my nostalgia alarm is making all sorts of noise. The fact the cover is drawn by Excalibur supremo Alan Davis is more than enough to part me from my pennies. X-Men Kitty, Rachel and Kurt reunite with Captain Britain and Megan to celebrate the arrival of their baby but I can't help thinking there's a twist in there somewhere; we shall see. Hard to believe this issue marks the 30th anniversary of Excalibur. 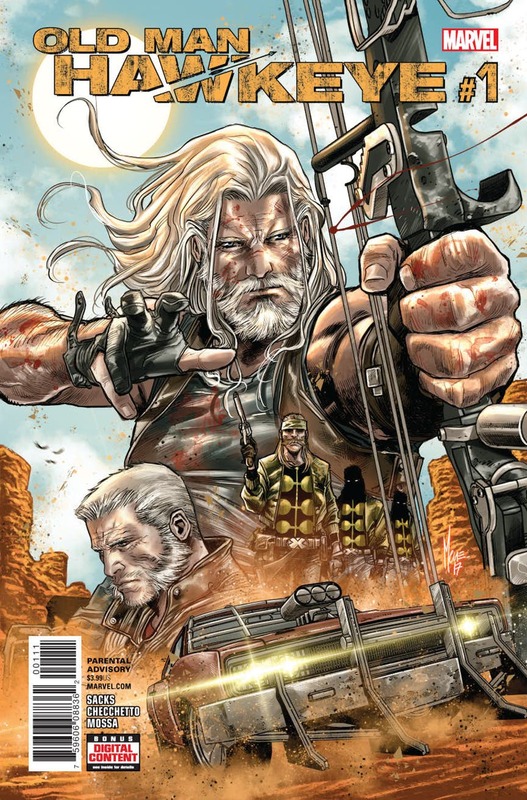 Set several years before the events of 'Old Man Logan', Old Man Hawkeye #1 (must have taken some time to come up with that title!) takes us back to the possible future and focuses on the former Avengers archer. Hawkeye is looking for revenge but must work fast, before he goes blind. Art by Marco Checchetto looks gorgeous. The first issue of Witchblade did enough to get me back for Witchblade #2, as Alex deals with her death and rebirth as the new host of the powerful, mystic artefact. Peter David returns to my pull-list as he brings old and new together in BSG Vs BSG #1. How will the modern incarnations of Battlestar Galactica react when they meet their '80s counterparts? This could get confusing but so much fun! Gabriel Rodriguez continues his sword and sci-fi series with Sword Of Ages #2. Always great art and his writing is proving to be pretty good too. Jo S: It’s impossible to imagine that this week’s Mister Miracle could top the last issue but I’ll give it a fair crack - Big Barda shot up to the No.1 spot in my Badass Babes list and I can’t wait to see what she’s meted out to those who were attempting to carry out Scott’s death sentence. Some standards pop up again this week: classy ghouls-and-gangsters tale Damned #6 and the beautiful watercolour artwork of Grass Kings #11 will be high on my list, and I’m continuing to indulge my appreciation for all things Matt Rosenberg with Secret Warriors #12 as Lunella takes the lead of her own team and must find a way to get them all pulling in the same direction. There's gathering cloud on the horizon though as this will be the last of this run: it has consistently brightened my week whenever it has appeared and I'll miss it. On the up side though, Phoenix Resurrection issues are exploding out every week currently, and the third will be a cornerstone for me - the Rosenberg magic touch continuing in this new guise. The manner of Jean Grey's reintroduction is starting to become clearer but when will we see the Phoenix touch down? 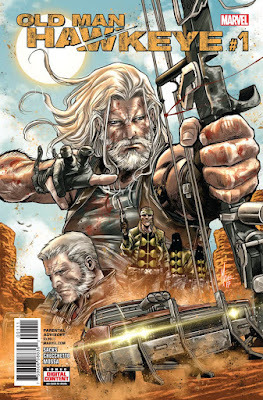 Just one first issue this week - I couldn’t resist adding Old Man Hawkeye #1 to my requests as Clint Barton suddenly became something of a favourite of mine with his appearance alongside Kate Bishop in the current Hawkeye series and, by coincidence, as I write this, it’s Jeremy Renner’s birthday. Happy birthday, Old Hawkeye!